As I wrote before I bought a number of omamori when we were in Japan: amulets purchased at temples, for various purposes. For example: the one I bought for Marli is for a happy marriage, but there's plenty of other kinds. Good luck, aid in studies, good health, and plenty, plenty more. For my dojo's sensei and trainers I bought charms from the Hakozaki shrine, dedicated to Hachiman (a god of war and harvest). The ones I bought were for success in sports and seeing how Hachiman is protector of warriors I reckoned that was appropriate for kendoka and kenshi. It gladdens me that my teachers were happy with the token of appreciation and at least two of them now wear their omamori on the inside of their do. Now it's time to delve a little into the one I bought for myself. Bought at the Todaiji temple in Nara the origin is a bit of a contrast with my teachers' amulets. Hakozaki's shrine is shintoistic and dedicated to a god of war, while Todaiji is a buddhist temple; we all know the buddhist's take on violence. "They are manifestations of the Bodhisattva Vajrapāṇi protector deity and are part of the Mahayana pantheon. According to Japanese tradition, they travelled with the historical Buddha to protect him. Within the generally pacifist traditions of Buddhism, stories of Niō guardians like Kongōrikishi justified the use of physical force to protect cherished values and beliefs against evil." 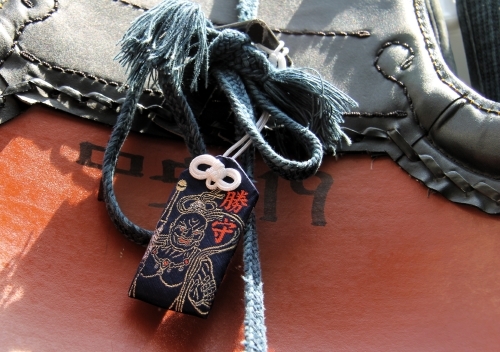 Funnily enough, Flickr user GreenTea has the exact same omamori on his (or her?) do. The fine people at Miyako Kendogu also sell an omamori specifically for success in kendo, however Andy Fisher later told me this is not actually a blessed amulet, but instead "rather they are more of a novelty/souvenir type omamori". Of course the best places to buy omamori for budo sports is from the Katori and Kashima shrines, origin of budo. Those shrines were out of our way though, being east of Tokyo. Interestingly I've learned that Amsterdam is home to Europe's only shinto shrine: Guji Holland Yamakage Shinto Shrine. At least there's a place close to home where we can safely (or at least in a traditional fashion) dispose of the omamori once they have served their purpose.